This photograph shows a member of our team preparing to abseil down a cliff in the Charyn Canyon, in the Ili River basin of southeast Kazakhstan. The Charyn River and its tributaries, a branch of the Ili River north of the Tien Shan Mountains, have cut canyons up to 300 metres deep, carving through rocks of different geologic ages, some as old as 540 million years. The name “Charyn” may derive from local Uighur or Turkic words for “ash tree” or “precipice” respectively, both of which are common in the area. Charyn Canyon is presently characterized by a cold semi-arid climate, with dry summers and cold winters. However, these conditions are likely to have varied through time, becoming wetter, drier, warmer and cooler in response to major climate systems’ changing intensity and influence over the region. Our research team investigates the past and present climate systems of the Cenozoic era, our current geological era which began 66 million years ago; the most recent 2.6 million years have been characterised by alternating ice ages and warmer so-called “interglacial” phases, and saw the evolution of humans. More specifically, we study climate systems in one of the most remote regions of Central Asia, known as the Eurasian Continental Pole of Inaccessibility. The area is a challenging place for climate research since it has no marine or ice core records, the most common calendars of ancient climate. This region is poorly understood yet important within the global climate system, since it lies at the boundaries of the major northern hemispheric climate systems. These systems, such as the Siberian high pressure system and Asian monsoons, are likely to have shifted, expanded and contracted over time. These changes occur in response to factors like mountain uplift, and changes in the Earth’s orbital patterns and incoming solar radiation. The aim of our study is to reconstruct climatic change over this period. By analysing various chemical and physical characteristics of the sediments, such as their age, magnetism, grain size and chemistry, we can reconstruct quantitative palaeoclimatic variability through time. Here we focus on an 80-metre thick layer of sediment, which alternates between layers of river-transported gravels and wind-blown dust deposits, known as loess. Younger sedimentary layers have thicker dust deposits, reflecting a long-term aridification trend in the Ili Basin and, more broadly, Central Asia. Our preliminary results from our fieldwork indicate that the canyon’s sediments represent an uninterrupted representation of the region’s climate from the Pliocene to early Pleistocene (from approximately 4.5 to 1 million years ago). 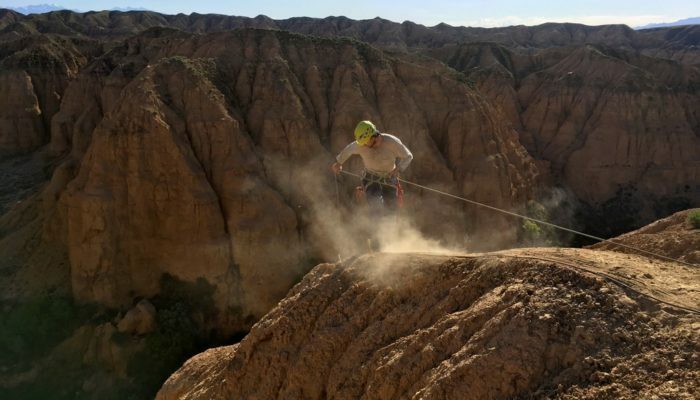 Achieving a comprehensive geological sampling of the Charyn Canyon was only possible by abseil. Our fieldwork, undertaken from May to June 2017, was a hot and dusty business, but ultimately a lot of fun. Definitely not for those with a fear of heights!